NEW YORK, Jan. 22, 2019 /PRNewswire/ -- As decision-makers deal with making sense out of an ever-growing, endless stream of data, top among the strategic initiatives for organizations in 2019 will be enhanced dashboards, automated reporting and augmented analytics. The key technology breakthrough addressing these initiatives is the addition of Natural Language Generation (NLG) to the current slate of Business Intelligence (BI) dashboards. NLG is a form of Artificial Intelligence, based on advanced computational linguistics and algorithms, that automatically turns volumes of raw data into written (or spoken) words as if composed by a human subject matter expert. Arria NLG, the global leader in AI-based NLG technology, is pleased to announce the release of its NLG Studio for BI 2.0—which gives data analysts the ability to create BI dashboards that are simpler and faster to interpret by instantly generating expert narrative from the entire data-set to accompany the visuals on their BI dashboards. This results in faster, better-informed decisions as decision-makers can now understand the entire data-set and see insights in natural human language that may otherwise have been missed or misunderstood in the visuals. The natural-language narratives increase consistency in how results and other facts are interpreted and communicated across the organization. The other key breakthrough with Arria's NLG Studio for BI is that it includes out-of-the-box solutions that are fully customizable by the user, whether novice or expert. The NLG technology is powered by the proven, rules-based linguistic capabilities and software architecture that Arria itself uses to build enterprise-level NLG systems for its global clients. Users can quickly generate personalized narratives tailored to their business needs, or create their own completely custom narratives for specific use cases. 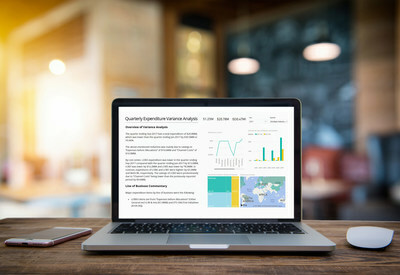 The resulting dashboards, including the visual and the narrative, can be automatically exported to PowerPoint, Word and RTF, with the narrative editable in the new format. According to Sharon Daniels, Arria's Chair and CEO, "NLG-driven multi-dimensional narratives are now the breakthrough that visuals were years ago. The Big Data problem was partially addressed with the evolution of BI dashboards. But, while visuals paint a picture, they're not the complete picture. A visual is only a partial representation of all the information contained within a dashboard. It doesn't give you the full story." "The data that's driving those visuals within the dashboard often contains untapped information and insights. Until now, much of it has been hidden from key decision-makers. With the addition of NLG, BI dashboards drive the next evolution of information delivery. Companies are able to scale at far less cost. Subject matter expertise is ultimately democratized. The ability to access key information in near real-time, communicated as if written by the company's top analyst, without bias—at an NLG writing-speed that is truly astonishing—that is where technology changes the playing field. It's what clients are demanding—complete information, faster conclusions and better decision-making. Moving the power of language from the mind to the machine fundamentally changes the way people interact with technology." Arria's NLG Studio for BI 2.0 is available for major BI platforms, including Microsoft Power BI, Tableau, Qlik Sense and MicroStrategy. Arria NLG is the global leader in the field of Natural Language Generation (NLG), a form of artificial intelligence software, specialized in extracting insights from complex data sources and communicating that information in natural language (i.e. as if written or spoken by a human). Arria's technology is adding value wherever on-demand narratives or reports are required, be it financial analysis and reporting, business intelligence dashboards, or alongside other cognitive technologies such as conversation agents and virtual assistants. Additional information is available at www.arria.com.